Should You Start a Business? It’s a question that many people might wonder about, at least for a bit. Even if you have no entrepreneurial spirit, you still might wonder: should you start a business? 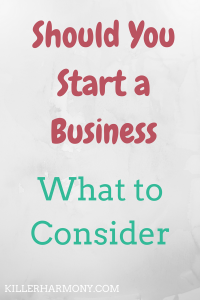 Today, I am going to give you some things that you should think about when deciding whether or not to start a business. Owning your own business can be tricky; you are in charge of everything. But, it can also be fun, if you are the right person for it. You can start a business doing almost anything. That makes it very easy to create a job you love. So, what else does entrepreneurship entail? Here are some commonalities between business owners. When you own a business, you are your own boss. For some people, that’s great. Other people might need someone to make sure they do their work. If you always get your homework done or you finish your job early, you might make a good entrepreneur. If you wait until the last minute to start writing a paper, you probably won’t be very successful. They Put Themselves Out There. While you definitely don’t need to be an extravert, you do need to be comfortable with marketing and networking. You don’t have to be talking to people all the time, but putting yourself and your business out there comes with the territory. One entrepreneurship myth seems to be that you work alone. Yes, that is true to a point, but business owners rely on peers and customers. Your business network is everything. When you own a business, you are in charge of accounting, marketing, legal matters, production and much more. You wear many hats, which means you need to be organized. Entrepreneurs cannot get away with having clutter and not knowing where things are. You business will fail if you can’t keep up with everything. In the ever changing world we live in, trends change. Therefore, business owners need to adapt their products, services and marketing strategies to fit with the new environment. If you do not enjoy learning new things, you will not enjoy entrepreneurship. You also probably won’t have much success. They Enjoy Doing Different Things. As a business owner, you have to do different tasks all day, unless you can afford to outsource to other business owners. Most business owners cannot afford that, at least not in the beginning. Not only will you spend time creating products or fulfilling services, you will also have business tasks. You might have to manage your taxes and invoices, send out a marketing campaign or do other administrative work. If you get bored doing just one thing, you will love this life. They Know a Business is Not Easy. Some people might think that entrepreneurship is easier than a regular nine-to-five job. The opposite is true. As a start up, you will have to spend more time than normal working on products or services and office tasks just to keep yourself afloat. The first few months can be the hardest, but success will come. Entrepreneurs know that success doesn’t happen overnight. It takes weeks, months, or even years. With regular jobs, you have your start date and two weeks later get your first paycheck. As a business owner, income is never guaranteed. You have to work hard for that first check. They Know a “REgular” Job is Not for Them. If you can’t stand the idea of spending your weekdays in a cubicle or stuck in some other office space, you will probably enjoy the freedom and flexibility that business ownership can have. The operative word being “can.” If you don’t want to work for “the man,” it might be worth spending some time building a business. They are Aware of the Risk. Starting a business is risky. You might succeed, you might fail. You also don’t have any benefits that you might receive with a corporate job. Health insurance, retirement savings and other securities are up to you. If you are in a situation where you have something to fall back on, it might be worth a shot. So, Should You Start a Business? That depends. If you love the idea of getting to do different things and you love learning, give it a shot. If you have parents or a spouse to help cover you for insurance and possibly financially, go for it. Especially for young people, there is really no better time to start a business than fresh out of college. You have few responsibilities, and you can afford to take the risk of starting a business. Have you started a business? Did I miss anything? Let me know in the comments. Be sure to read my previous post and follow me on Twitter (@HannahHaefele) so you don’t miss future updates!